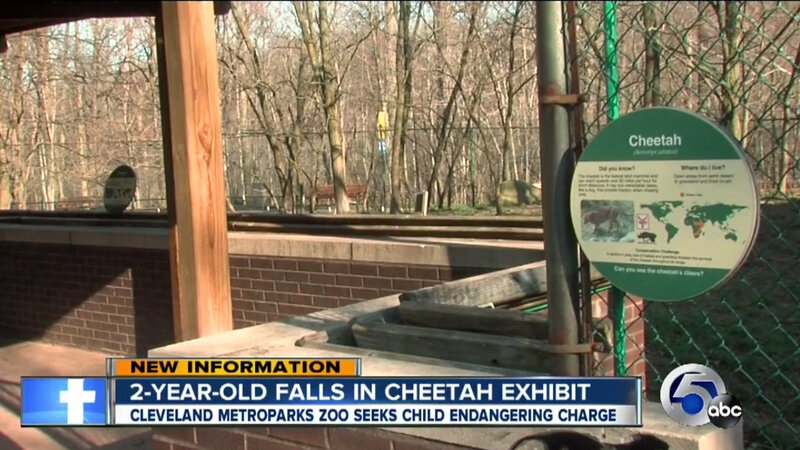 An Ohio zoo is pressing charges against a mom who they say dangled a child over the railing at a cheetah display at the Cleveland Metroparks Zoo — and when she lost her grip, the boy fell. Fortunately the 2-year-old boy will recover, but he sustained a 10- to 12-foot fall in the incident, which left him with leg injuries. According to the zoo’s executive director, Dr. Christopher Kuhar, a number of witnesses reported that they saw the mother holding the child over the railing when he slipped out of her grasp. Immediately after the boy plunged down into the cheetah display, another adult with the group jumped in to retrieve him, and witnesses say that other adults helped pull them both to safety. Thankfully, the cheetahs housed in the display didn’t investigate the humans, or even seem to notice they were in there. While some reports say that the child was held over the railing, others say that the mother was holding two kids and one twisted out of her grasp and fell over the fence. Obviously if someone is going to dangle their child over a railing at a zoo, then charges of child endangerment should absolutely be undertaken. There is no good reason to hold your child up at that level when there is risk of a fall (not to mention the animals that may be lying in wait for your kid). I understand wanting your child to be able to see an elusive beast, but that’s simply a risk you cannot take. It’s a little more understandable if you’re standing at the railing and your kid twists out of your grasp. I know how unpredictable little kids can be, but at the same time, as I already know this, I would make it a point to not hold two children close enough to a barricade that they could conceivably make their way over it. While it’s super easy to judge this mom, I do believe it’s warranted if she truly did dangle her boy over the edge. I was really happy to hear the child will recover and is in stable condition in the hospital, and I hope that he’s not terrified of zoos from here on out.